Description: Do you love angels and want to communicate with them? Are you feeling confused, unsettled, in need of guidance for yourself or a loved one? Do you have a health issue that needs healing? We all have guardian angels and guides who are ready to talk to us and help us feel joy and happiness. Working together, we can bring you clear answers, peaceful resolution, healing and happiness. And you will move forward with purpose, knowing you have the best life coach right behind you- your guardian angel! There is an abundance of love and healing energy around each of us, and we just need to invite it in. Angelic healing and communication, lead by certified ANGEL THERAPY PRACTITIONER® Gera Farkas, can assist you on your path. Come and experience an evening of angelic healing, with guided meditation, mini readings and angel communication in a safe and sacred environment during this one hour workshop. 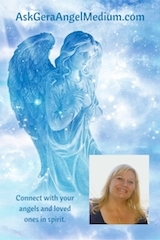 Whether you are just beginning to explore angels or you are a practiced student, the group energy and light will leave you feeling happier, lighter and more connected and joyful. Let’s explore together. and get the guidance you need! 15 minutes just $22 30 minutes just $44 one hour just $88 Contact Gera today for your specially priced reading. Email me about readings and any questions about my services.